The disruption in economic scenarios is forcing organizations to realign their human resources strategies to meet the new age challenges. The businesses are expecting much higher productivity and performance from the employees, managers and other stakeholders of the organization. On the other hand, employee’s expectations from their organizations are also dramatically high. Employees today, expect very high level of comfort, engagement, experience and technology at their workplace as well. These massive expectations of both workforce and organization can be met only by implementing the right technology in every walk of work-life. The revolution that started from biometric attendance systems and legacy HRIS is now experimenting with complete transparency, usability, user experience, virtual reality, robotics and artificial intelligence. Noida headquartered, Empxtrack, has brought to the table one of the first Integrated Digital HR Product that has been at the forefront of developing latest technology platforms, redefining HR processes and providing performance and productivity tools to workforce. Empxtrack technology helps companies to manage their processes in a way that becomes the basis of great employee experience at every touchpoint. The onboarding tool ensures that the candidates are inducted quickly, effectively and in a friendly manner. Within a day or two the organization can capture all information about the new employee and communicate its core values and processes including its vision, objectives, policies, compliances and anything else that is required to be the part of the family. As the employees gets on to their desk, the initial trainings (digital, classroom or on-the-job) help the employee learn more about the company, their function, how work is done and the processes they need to follow. Accordingly, the Goal Setting tools help them understand the company’s expectations in a transparent and fair manner. As they start being productive, the managers can review their performance, coach and guide them on regular intervals and recommend new ongoing trainings. This objective approach not only makes the employee more productive, it helps them experience a great work-life balance. The Performance Management System from Empxtrack ensures that the employees are judged on basis of their contribution to the team and the organization. Their career stays on the growth trajectory and organizations can compensate them appropriately, according to the value that they bring to the table. Empxtrack is blend of latest cloud based software technology, best Global HR practices, experience of performance management in 20+ industries and vision of its enthusiastic founders. A multi-tenant, cloud based solution Empxtrack is an Open Source Java based application. It hosted on secure servers, and 128 bit or higher encryption for communication with browsers. It has APIs that allow integration with other applications like SAP, Oracle, ADP and many other leading ERP systems. It provides SSO integration for easy access and is very adaptable to configuration and customization needs of individual customers based on its unique ‘dynamic-code-injection-technology’. 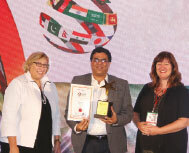 Led by Tushar Bhatia, the awardee of ‘Outstanding Contribution in HR’ by Asia Pacific HRM Congress for his commitment to Human Resource technology, Empxtrack shows promises to continue giving stellar products in the years to come.